We refer to line striping as the icing on the cake here at Houck Asphalt Maintenance and have more experience than any other line striping contractor in our area. We are a professional company that has been going strong since 1989. Every customer can expect to receive high quality craftsmanship from professionals who take pride in offering 100 percent satisfaction. Line striping and Houck Asphalt Maintenance are a powerful combination. Our reputation will speak for itself. Line Striping must be of the highest quality while ensuring that the traffic flows safely and smoothly. Houck Asphalt Maintenance can offer years of experience and much more to each valuable customer. 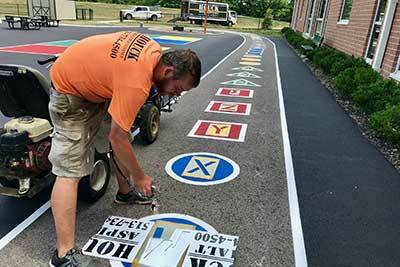 Every line striping project can be a clearly-marked masterpiece. Every parking lot has the potential to look beautiful and should be fully functional too. Houck Asphalt Maintenance takes a great amount of pride in every project were awarded and we ensure that every parking lot flows and operates safely. A parking lot must be well-cared for and provide a clear space for every driver and pedestrian. 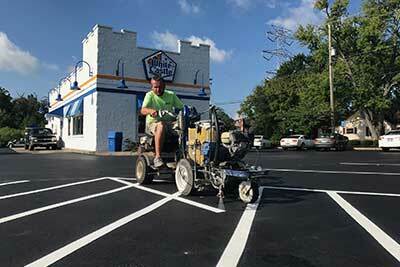 A quality line Striping job can vastly improve the curb appeal of a business and/or parking lot. Houck Asphalt Maintenance can offer years of experience from the crews to the management. A parking lot masterpiece will be both inviting and appealing. Line Striping is one of the economical options that will provide each customer numerous benefits. Improving the entire appearance of a parking lot is very important. Your parking lot needs are in good hands with Houck Asphalt Maintenance. Line Striping is taken very seriously and every lot will be in compliance and handicap-accessible. Your parking lot can have it all including a fresh appeal and much more. 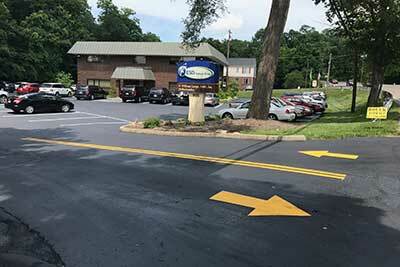 Line Striping from a professional company will greatly improve your entire parking lot. We would be honored to manage your line striping needs. Line Striping will help you to make a loud and clear statement to all those who visit your property. Every parking lot will tell a story. Line Striping will assist you in making a quality statement to your customers. Your particular statement will impress many when quality line striping is completed. The Houck reputation will not let you down because quality line striping is guaranteed. Houck Asphalt Maintenance line striping raises the bar when it comes to quality and professionalism. A quality line striping project will allow you to feel a strong sense of pride in your establishment. Your customers, vendors and employees will know that attention to every detail is included. A well-marked lot will be helpful in navigating around while showing off your concern for others. Do not underestimate the importance of a well-marked lot because those around you will notice. Houck Asphalt Maintenance will show you exactly what we can do for you. We're ready to show off our reputation by outperforming the competition. Our customer service is top-notch. Quality craftsmanship can be expected when you contact Houck for your asphalt and line striping needs. If you are ready to be amazed, contact us today and allow Houck to show off our talents. Satisfaction is guaranteed by our team of qualified professionals with over 50 years of combined experience.